Lot 103. A rare famille noire five-piece garniture, Kangxi period (1662-1722); 15 3/4 in. (40 cm.) high, each. Estimate USD 60,000 - USD 80,000. Price realised USD 68,750. © Christie's Images Ltd 2019. 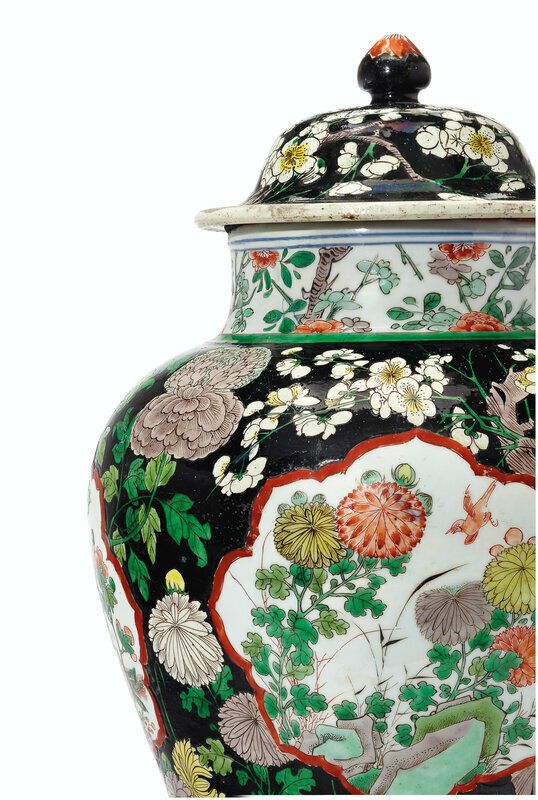 Each piece enameled with four flower-form panels enclosing birds among large chrysanthemum blossoms, all on a black ground of flowering prunus, chrysanthemum and peony, comprising three jars and covers and two beaker vases. Provenance: The Estate of Laurance S. Rockefeller; Sotheby's, New York, 11 October 2005, lot 13 (one jar and cover). With Ralph M. Chait Galleries, New York (one jar and cover and both beakers). 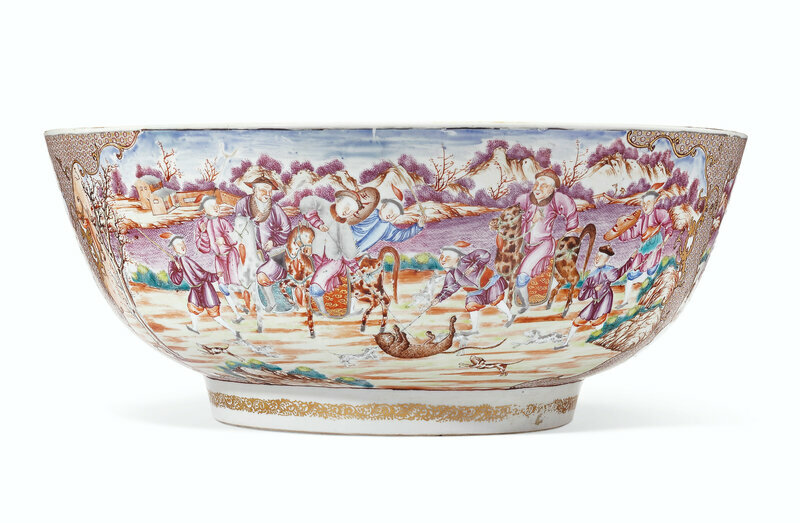 Literature: William R. Sargent, Chinese Porcelain in the Conde Collection, Madrid, 2014, frontispiece. 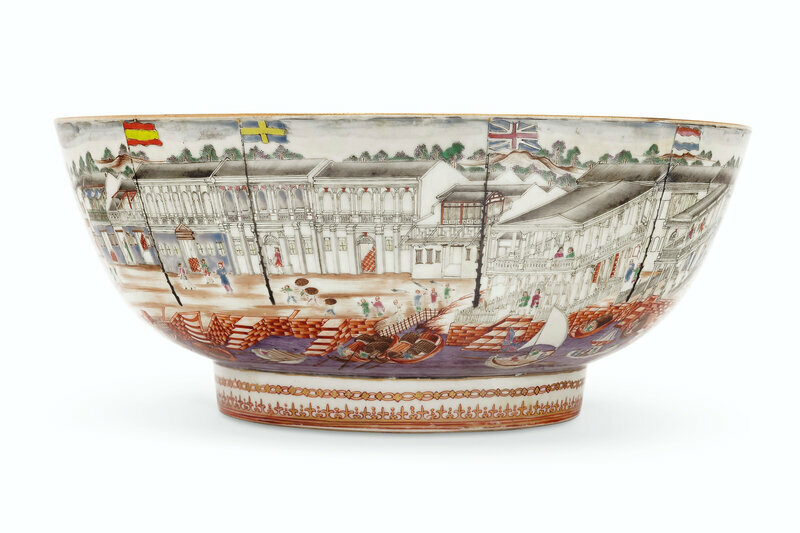 Note: Although black wares were known in Song ceramics, the taste for what was later named 'famille noire' was almost exclusively a Western taste developed in the Kangxi period. These sumptous wares were esteemed by collectors in that period like Augustus the Strong of Saxony and much later became highly desirable amongst major turn of the century collectors like Frick, Widener, Garland and Salting. Famille noire comprised a good part of the J.P. Morgan collection that was famously acquired through Duveen by John D. Rockefeller, Jr. in 1915. Compare this garniture, which was brought together by the Tibor Collection founder, with a nearly identical, "rare five-piece famille noire garniture" from a private collection sold Sotheby's New York, 27 November 1990, lot 187, and probably the same sold Christie's London, 5 October 1970.